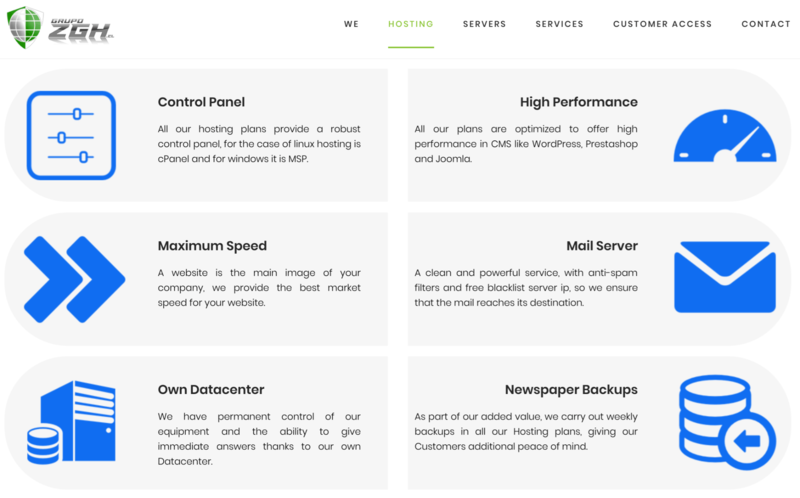 Grupo ZGH Review 2019: Is Grupo ZGH a Good Hosting? Chilean company Grupo ZGH offers web hosting with SSD RAID 10 storage and beginner-friendly features. The entry-level packages are well priced, but the higher plans are overpriced considering the lack of advanced features. Grupo ZGH has been providing hosting services in Chile since 2009. This host houses its servers in a Chilean data center, and – as you might expect of a Chilean company – its website is in Spanish. Grupo ZGH owns its own data center, which is good news in terms of rapid responses to technical issues. With this host, you get 99.8% uptime that is backed by a service level agreement (SLA). Not the highest uptime, but it’s nice to see an SLA. The Linux shared website hosting and reseller hosting plans use SSD RAID 10. SSD gives disk read/write speeds up to ten times faster than HDD, whilst RAID 10 means your data is secure if anything happens to one of the drives. These plans are basically for beginners who can benefit from the RVsitebuilder website building tool and the Softaculous one-click installer for additional programs. But the plans are not really suitable for advanced users. Although you get unlimited FTP, there is no support for PHP or advanced coding languages (except ASP.NET in the Windows plan); not mention no Cron jobs and no SSH access. This provider’s pricing is interesting. Their eight Linux plans all come with exactly the same features, but the price changes according to the amount of disk space and number of subdomains, domains, and email accounts. You can grab a bargain with the lowest priced plan if 1 GB disk space and one domain are enough for you. Although the price increases for five or more domains, the Advanced plan is still pretty good value for 15 GB disk space and unlimited domains. Since you get a free SSL certificate and a free website builder, the only thing you need to add on at an extra cost during the checkout is a domain name. Plans can be bought on terms from one month to three years, but you only get a discount if you make the maximum three-year commitment. You’ll have to dig deep into this company’s terms and conditions to find it, but there is a well-hidden 30-day money-back guarantee that should make the maximum commitment less risky if it all goes wrong within the first month. Although it’s advertised as 24/7 support, the support options are quite limited. You can contact the support team only by telephone, ticket, and email, with no live chat or social media messaging options. If you want to support yourself, you can forget it because the knowledge base is non-existent. Grupo ZGH supplies Chilean hosting services from its own data center. While new users will find a lot for them, expert webmasters will have to look elsewhere. The uptime is good (although not backed by an SLA), and there are some large businesses such as Scotia Bank in this company’s portfolio. Wondering how Grupo ZGH stacks up against other Web Hosting companies? Enter any other Web Hosting company and we will give you a side-by-side comparison.